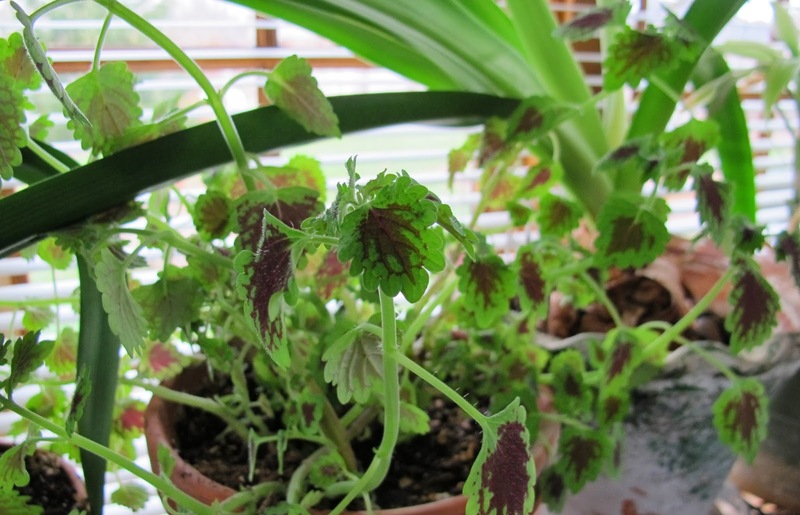 I'm taming a coleus and making it a houseplant. Awhile back, a co-worker suggested I read Nemesis by Agatha Christie because the murder takes place on a garden tour. Of course Christie's famous detective, Miss Jane Marple, is on the tour and figures out who committed the murder. I was hooked after I read Nemesis and decided to read all twelve Agatha Christie mysteries featuring Miss Marple. They would be a nice diversion from gardening and gardening books! I'm pleased to report that I just finished reading the twelfth book this past weekend. Along the way, I highlighted a few of my favorite passages. I've shared some of them before, but they are worth sharing again, all in one place. Would you like to read a few of them? 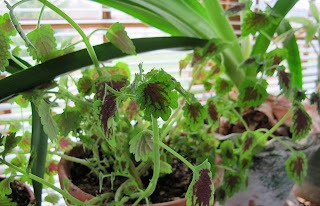 "It is like when you get ground elder really badly in a border. There's nothing else you can do about it--except dig the whole thing up." Isn't that the truth. Sometimes there are so many weeds it really is best to just dig up the whole border and replant it. "The out-of-date becomes picturesque... Look how people wanted old-fashioned roses now, and scorned hybrid teas. I was a bit taken back when I read this. I pulled this quote from a mystery written in the early 1960's. I thought hybrid teas were all the rage back then. I had no idea that people were already turning back to the old-fashioned roses in the 60's. I thought that was more recent. Guess it goes to show, what's old is new again, just like the quote says. "Mrs. Bantry was on her knees. A good day for hoeing. Nice dry soil. But hoeing wouldn't do everything. Thistles now, and dandelions. She dealt vigorously with these pests." If you didn't garden you would learn two things from this quote. First, that nice dry soil is best for hoeing. Second, that hoeing isn't always the answer for tougher weeds. For those, nothing short of hand-to-hand combat-- pulling--will work. "But it's gardening that's needed here. And that isn't learned in a day. Gardening, that's what this place needs." I've decided that this is my new answer to every problem, every question about what to do. "It's gardening that's needed here." Those are words to live by. Yes, it was good to read some Agatha Christie mysteries to take my mind off gardening, even for a short time. What a delightful collection of quotes! It makes me think that maybe I should revisit Miss Marple. Agatha Christie is timeless. I hope you enjoy reading Agatha Christies books. Her holiday home on the coast in Devon isn't far away, its where we take all our visitors, near Dartmouth, the only way to get there is by steam train! I love Agatha Christie's mysteries and have probably read most of them. Great selection of quotes!